Both city and resort hotels are increasingly responding to the need of business travellers to bond with their loved ones when not on the road. The range of facilities and activities aimed at engaging the youngsters in the family, while their parents spend quality time together, has grown enormously and in creativity. Here are six to consider for a future weekend or holiday. About the hotel: Hailed as one of the best golf resorts in Asia, the Empire’s hotel and country club offers MICE and spa options. Adventure seekers can also partake in jet skiing, windsurfing and parasailing. Souvenir hunters would also be glad to know that within the hotel compound are shops selling items from Brunei’s local craftworks to designer clothes and furniture. For the kids: While the adults indulge in a spa session or busy themselves with a meeting, the children can be kept occupied at the E-Kids Club. Different hourly activities are scheduled every day of the week, offering children a plethora of events. For example, “Sporty Friday” has a kayaking lesson at 1100, beach soccer at 1400 and board games at 1600. Activities also cater to children who prefer to stay indoors. At 11am on Fridays, children are able to learn basic Malay. How to get there: The hotel is a 15-minute drive from Brunei International Airport and 20 minutes away from Bandar Seri Begawan, the capital and central business district of Brunei. About the hotel: Located on the fashionable Jumeirah Beach is the 138-room hotel. The Mediterranean-styled resort is adjacent to The Emirates Golf Club and The Montgomerie Dubai golf courses. Guests can also enjoy the 35,000sqm of landscaped gardens and 350m of white sandy beach, making the hotel an exclusive private playground. 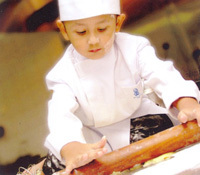 For the kids: The Ritz Kids Club has themed acitivites lined up every day catering to children aged four to eight. Wednesday’s “Mini-Chef Day” has children cooking from 1030 to 1200. A treasure hunt is also scheduled for the afternoon. Friday’s “Fitness is Fun” contains activities such as ten-pin bowling and a dart tournament. Children below four can participate in the activities but a parent or guardian is required to accompany them. How to get there: The drive from Dubai International Airport takes just under an hour. About the hotel: Grand Hyatt Bali’s 648 guestrooms lie in the luxury stretch of beachfront on the Bali island. Conceive as a water palace, onsite facilities include a 120m lagoon pool, an outdoor river pool with a 50m water slide and a Balinese feature pool. For those seeking to commune with the sea, the beach is just five minutes away and is conducive for deep-sea fishing, scuba diving, water-skiing, parasailing and fishing. For the kids: Camp Nusa, under the Camp Hyatt service, provides a place for babysitting. Upon registration, each child gets a “passport” with basic information and food preferences to make their time in Camp Nusa enjoyable. The programme is not only fun, but educational as well. 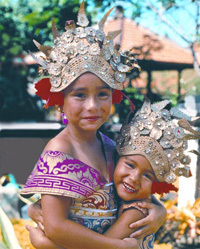 Balinese arts and crafts and Indonesian language classes will appeal to those culturally inclined. Alternatively, the river pool’s 50m water slide remains a perennial favourite. How to get there: Ngurah Rai International Airport is a 15-minute drive away. The city centre is 30 minutes from the hotel. About the hotel: The 259 guestrooms at Four Seasons Tokyo at Chinzan-so are among the most spacious in the city. The hotel’s design ensures that each room has corner windows with views of either the gardens or the Tokyo skyline. Traditional Japanese onsen (natural hot springs) with healing mineral waters from Izu Peninsula comes complimentary with every stay. For the kids: Before your stay, provide the hotel with the name and the age of the children. The hotel will prepare a welcome package for them, comprising child-size bathrobes, children’s toiletries, complimentary milk and cookies upon check in and children’s menus for the restaurants and in-room dining. Guestrooms can also be childproofed upon request. Children are also allowed complimentary teddy bears and use of thermometers, strollers and baby bathtubs. Children under the age of 18 can share their parents’ room at no extra charge. How to get there: The most convenient way to reach the hotel from Tokyo Narita Airport is via the airport limousine bus. The 90-minute journey drops guests right in front of the hotel. 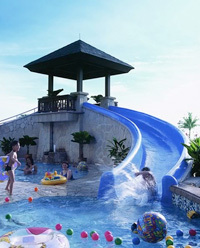 About the hotel: The Westin Langkawi Resort & Spa is surrounded by the Andaman Sea, tropical foliage and sandy beaches. Each of the 202 guestrooms comes with the signature Heavenly Bed. Guests can also enjoy Westin’s Service Express, a service that streamlines guests’ requests. Venture 3km out and you’ll reach the main shopping area, Kuah Town. For the kids: Westin Kids Club offers half- and full-day programmes. Activities are themed based on the day of the week, such as “Marine Mondays”, “Tasty Tuesdays” and “Westin Wildlife Wednesdays” among others. Do note that The Westin Kids Club is for children aged four to 12 only and parents are not allowed during activity hours. Children looking to stay indoors can entertain themselves with a Wii station, available upon request. How to get there: The resort is a three-minute drive from Jetty Point, if you’re taking a ferry to Langkawi. For those flying in, the resort is a 20-minute drive from Langkawi International Airport. About the hotel: Having recently undergone a three-year major renovation, Shangri-La’s Mactan Resort and Spa, Cebu now boasts 547 rooms and suites with stylish design and sleek contemporary furniture. The highlight is the Ocean Wing, whose rooms face the Visayan Sea and the outlying islands. A room in this wing will make your stay exceptionally memorable. For the kids: Children aged four and above can busy themselves at the Adventure Zone, a three-storey indoor playground complete with rope swings and ladders. Supervision by well-trained staff help ease worried parents should their child be playing on the 180-degree vertical drop slide. Children three years and below can join string painting and handprint art to enhance their hand-eye coordination skills. Those from four to eight can choose mild activities like arts and crafts, or those looking to get physical can partake in pool games. Children from nine to twelve can also attempt sports such as snorkeling and kayaking. How to get there: The resort is a mere 15-minute drive from Mactan-Cebu International Airport.